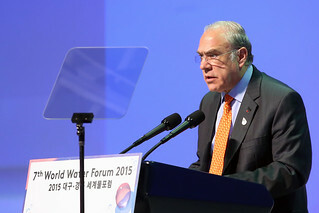 I am delighted to be here in Daegu at the 7th World Water Forum. It is amazing to see the best and the brightest gathered around two atoms of hydrogen and one atom of oxygen. The water challenge is one of the most pressing global issues of our times. Water has been one of my top priorities long before I became Secretary-General of the OECD in 2006. Over the past nine years, the OECD has built considerable evidence and guidance on the economics, management, and governance of water policy. The case for drastic action to address water security and governance is environmental, humanitarian and economic. OECD projections reveal that by 2050, over 40% of the world’s population, 3.9 billion people, are likely to be living in regions under severe water stress. And around 1.4 billion people are still expected to remain without access to basic sanitation. Our work with the Global Water Partnership reveals that the global cost of droughts, floods and poor water supply and sanitation are in the order of at least 500 billion dollars each year! This is both a human tragedy and a considerable drag on economic growth. And it will only get worse as climate change intensifies. In 2015 we have a once-in-a-generation opportunity to take coordinated, effective international action to ensure water security and promote better water governance. We have the proposed Post-2015 Sustainable Development Goals in which water is prominent, both in its own right, and linked to other goals on poverty reduction, food security, energy, biodiversity and climate change. The latter will also be addressed at COP 21 in Paris. Let me highlight two key objectives that should be our focus here at this timely World Water Forum. First, strategic investments in water infrastructure are key to support and sustain growth. Financing is challenging in the current financial climate. The joint OECD - World Water Council High Level Panel on Financing Infrastructure for a Water Secure World suggests some ways forward, including improving the risk reward ratio and refining the 3Ts of water finance (Tariffs, Taxes and Transfers). I’ll be discussing these ideas in greater detail in the side OECD side event tomorrow on ‘Water and Cities’. Second, better water governance is essential. We have enough water on earth, we have the technology, but we often lack the political will and, ultimately, implementation is the key challenge. Water governance is a top priority for the OECD. Our Principles on Water Governance, developed in the aftermath of the 6th WWF, set out 12 “must-haves” to provide sustainable, integrated and inclusive water management. Dear waterwomen and watermen: The costs and consequences of inaction on water are colossal, both in economic and human terms. This Forum is a meeting of the best water minds “from across the seven seas”. I am confident that, with the best evidence at your fingertips, a lot of political will, some financing, and some time, we can deliver Better Water Policies for Better Lives.